Based on the novella by German playwright Peter Handke, who would be his collaborator on Falsche Bewegung, Wenders’ debut The Goalie’s Anxiety is a portrait of alienation, where meaningful communication has ground to a halt. 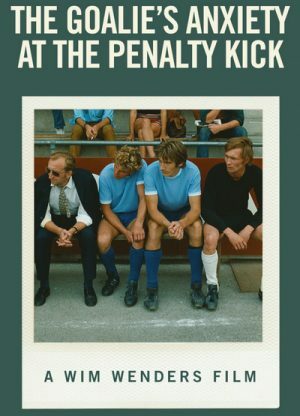 The story kicks off when anti-hero and professional footballer Joseph Bloch (Brauss) is given the red card for protesting against a goal scored (in his opinion) from an off-side position. In the aftermath, he wanders around Vienna losing the will to live until his first casual sexual encounter with Marie (Bardischeewski). Next on the list is Gloria (Pluhar), a cinema cashier who sells him a ticket for Howard Hawks’ Red Line 7000. After spending the night in her flat near the airport, Bloch strangles her without any apparent motive and sets off for Bierbaum, a small border village near Hungary. There he falls out with his old friend and innkeeper Hertha (Fischer), after trying to flirt with her and barmaid Anna (Schwarz), without really showing any real commitment to either. He then bores a salesman rigid with his stories about penalties, as the two watch the game. Bloch is unconcerned about being pursued by the Police, even when he sees a composite drawing of his mug in the newspaper he stays put.